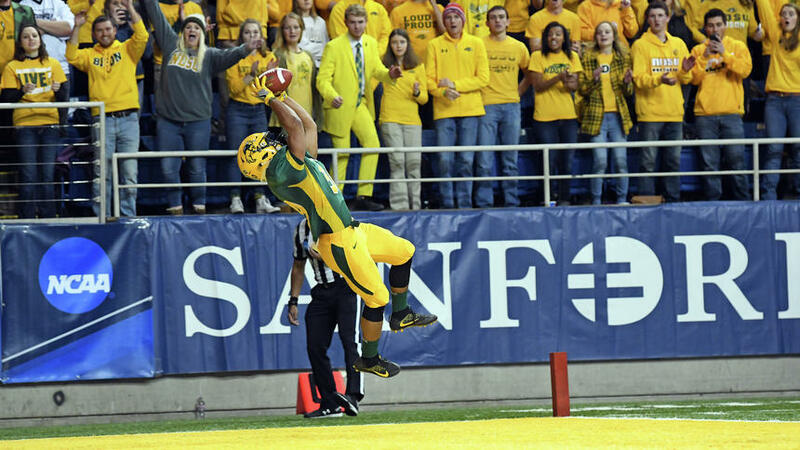 North Dakota State’s Seth Wilson leaps to grab a 18-yard touchdown reception against Wofford during the FCS quarterfinals at the Fargodome on Saturday, Dec. 9, 2017. FARGO, N.D.–North Dakota State caused two turnovers in the second quarter that led to two late touchdowns and the #2 seeded Bison routed past #7 seeded Wofford 42-10 in the quarterfinal round in front of 17,008 fans in the Fargodome. The win moved the Bison into the semifinals of the Division I FCS playoffs for the seventh consecutive season–at best all-time in the playoffs. NDSU (12-1) took advantage of two Terriers fumbles in a three-touchdown blitz in the last five minutes before halftime, where the Bison led 35-10. The Bison had a first-round bye and then routed San Diego 38-3 in the second round. Now NDSU will host a national semifinal next Friday night or Saturday afternoon against the winner of Saturday’s quarterfinal between Kennesaw State and #6 seed Sam Houston State. Wofford (10-3), however, actually opened the scoring in the game with a 40-yard field goal from Luke Carter with 9:04 left in the first quarter. But NDSU scored two straight touchdowns on passes from Easton Sick—48 yards out to tight end Conner Wentz and 18 yards out to running back Seth Wilson to give NDSU a lead they would not relinquish. Wofford would score its final points of the day following the Wilson score on an Andre Stoddard three yard run to make it 14-10 with 10:31 left in the second quarter. From then on, it was pretty much all NDSU offense and NDSU defense. Bison running back Bruce Anderson scored from a yard out to stretch the lead to 21-10 with 4:49 left in the second. On the ensuing position, Wofford gave it right back on its first play from scrimmage when running back Blake Morgan fumbled and Bison safety Robbie Grimsley returned down to the 4-yard line. NDSU made cashed in with a four-yard touchdown pass from quarterback Easton Stick to tight end Jeff Illies to make it 28-10 with 3:50 left in the opening half. The Terriers’ Brandon Brown fumbled the following kickoff, with Jabril Cox recovering it at the 32. The Bison made it a 35-10 halftime advantage on Anderson’s five-yard run with 54 seconds left in the half. Stick ran seven yards for a touchdown in the third quarter for the game’s final score and spent the fourth quarter on the bench with the game in hand. Stick finished the day 11-of-16 passing for 184 yards and three touchdowns. He completed passes to nine different receivers and added 49 yards rushing on eight carries. Ty Brooks led the NDSU rushing attack with 84 yards on the ground. Blake Morgan led Wofford in rushing with 60 yards. The Bison defense held Wofford to a season-low 177 total yards. NDSU’s offense totaled 464 total yards, 261 of which were rushing.